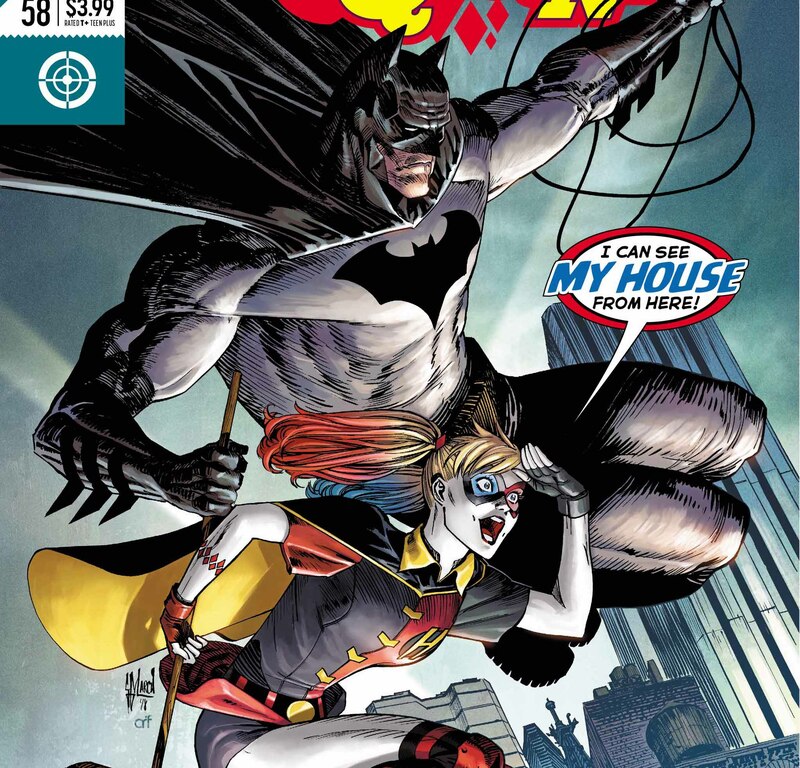 Harley Quinn #58 Review – AiPT! All three creators are firing on all cylinders in this series. This review contains spoilers for Harley Quinn #58. Less than twenty-four hours after accepting a new gig as Mirand’r’s “Seeker of the Lords,” complete with the potential for a sweet promotion and cool magic belt, Harley finds herself detained by Batman under the pretense of murder. Shackling herself to the Dark Knight with the vigilante’s own bat-manacles, the former clown princess of crime vows to help Batman solve the mystery. With Batman’s help, will Harley be able to exonerate herself of all wrongdoing, or will Arkham need to warm up her favorite padded cell? From Humphries’ clever banter between Batman and Harley to John Timms’ wonderful artwork and Alex Sinclair’s colors, there is a lot to love about Harley Quinn #58. However, one of my favorite elements of this issue is Humphries’ examination of Harley and how he illustrates character growth through her actions. Certainly she’s still a violent sociopath, as witnessed in the issue’s final battle, but now she’s a violent sociopath with a heart of gold and the gumption to become The Lords of Chaos and Order’s Angel of Retribution. As this new Dynamic Duo proceeds from one crime scene to the next in their murder investigation, Batman and Harley are hounded by Gotham’s police force. With sirens rapidly approaching their location, Harley notices a man attacking a woman and her son. Reacting quickly, Harley drags Batman from the rooftop into the alley below in order to stop his assault and comfort the victims. I think this is an excellent example of Humphries illustrating Harley’s character growth. As Batman states, “The old Harley Quinn would never have risked imprisonment to comfort a mother and her son. Maybe you have changed.” This goes a long way in affirming her growth. Humphries’ choice to have the first trial prey on Harley’s insecurities was exceedingly wise. The fact that it sought out to undermine her personal feelings of growth adds a sense of drama to which I think every reader can relate. Every person has made a poor choice or series of poor choices that they fear may define them. Rooting the conflict in this notion allows the reader to feel empathy for Harley. Additionally, by showing that she was able to overcome this fear, Humphries is able give others who struggle with similar issues hope. In order to build toward the reveal of the true murderer, Humphries has to move quickly through much of the duo’s detective work. This is not necessarily a bad thing as the issue’s true conflict deals with Harley overcoming the fear that she is irredeemable. However, the reveal of Lord Death Man as the true villain is either hit or miss. Humphries certainly lays out the clues pointing toward the true culprit throughout the issue. Unfortunately, this reveal is more meaningful if you have read the story arc involving this character. Otherwise, this reveal kind of feels like it come out of left field. John Timms’ artwork expertly conveys the issue’s action as well as dialogue driven detective sequences. His facial expressions wonderfully illustrate the emotions that each of the characters are experiencing throughout the issue. Additionally, Alex Sinclair’s colors maintain a vibrant tone that matches Harley’s personality. Some of my favorite pages involve the battle with Lord Death Man and his henchmen. Timms’ artwork with Sinclair’s colors beautifully show how these former enemies can effectively work as a team. Additionally, I need a poster of the page Timms created as an homage to the The Dark Knight Returns with Harley replacing Carrie, stat! In spite of the hit or miss reveal involving Lord Death Man, there is a lot to love about Harley Quinn #58. Through grounding the conflict in relevant themes, Humphries has constructed an issue that everyone can enjoy. From Humphries’ expert character exploration with clever banter between Batman and Harley and to John Timms’ wonderful artwork and Alex Sinclair’s colors, all three creators are firing on all cylinders. From Humphries’ clever banter between Batman and Harley to John Timms’ wonderful artwork and Alex Sinclair’s colors, there is a lot to love about Harley Quinn #58. Humphries' exploration of Harley's character growth. John Timms' artwork and Alex Sinclair's colors. Humphries' use of relevant themes allows use to feel some empathy for Harley. The reveal of Lord Death Man as the issue's true villain works if you've read prior issues, otherwise it feels as though it comes out of left field.